Description: Although these three parcels (totaling 17.6 acres) were acquired at different times, they adjoin one another and are administered as one. They are located between Dayton Road, Grindle Brook Road, and Highridge Road. To the south lies the former Reardon land (21 acres) which was acquired as open space by the town around 2008. Booth Woods lies in the Grindle Brook watershed which is considered pristine and eventually flows into Great Pond where at most times of the year it is absorbed by the gravel deposits. Grindle Brook itself flows through a corner of Booth Woods. The entire site is forest covered (oak/hickory forest with a few conifers). The site includes low stone walls defining the eastern and part of the southern border. The terrain is highly uneven, with steep slopes, and with wetlands along the streambeds. There are remnants of old haul roads on the property. Notable Features: There are several small scale feldspar quarries -long abandoned-on the property at one time operated by a family named Chapman. Feldspar was carted via Main Street and Dug road to the mill near the Water street bridge over Roaring Brook. Conservation Purpose: Wildlife habitat and protection of water quality at Grindle Brook. Preserve Management: Standard policy applies. Acquisition History: These two parcels were a gift in 1998/99 from Richard and Barbara Booth. Richard Booth was a senior executive at Travelers and later CEO of Harford Steam Boiler. The Booths moved to Essex in 1998. 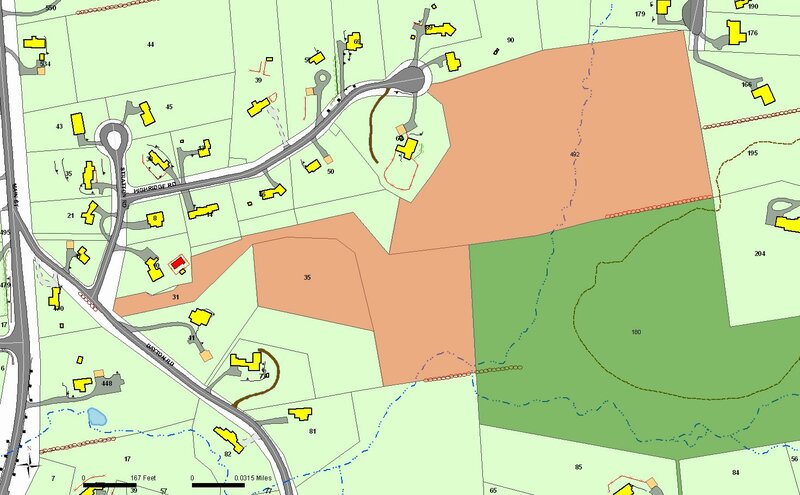 The smaller parcel had actually been subdivided for development before the Booths, who lived at the end of Highridge, bought it for their own protection.